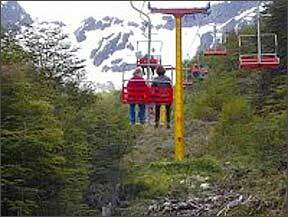 Ushuaia, at the southern extreme of Patagonia, offers tourist resources that are quite unique in the world. A land of legends that many audacious spirits in the world have dreamt of visiting, and a land rather barren, inhabited only by those who have accepted the challenge of loneliness, their only company being nature at its best! 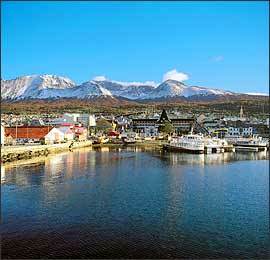 Located on the shores of the Beagle Channel, Ushuaia is the southernmost city in the world. 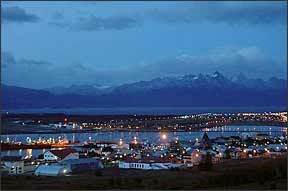 The city of Ushuaia is the capital of the Tierra del Fuego, Antarctica and Islands of the South Atlantic Province. It was founded on October 12, 1884, and the meaning of its name in Yámana language is "bay that penetrates towards the west." It is surrounded by the mountain range Martial that offers a unique combination of mountains, sea, glaciers, lakes and forests, overlooking the Beagle Canal, in the South end of the continent. There you are only 625 miles away of the Antarctic peninsula and 1900 Miles south from the city of Buenos Aires. It has a modern international airport, and a seaport with an excellent infrastructure (receives over 200 cruises during summer season), connecting Ushuaia with the rest of the world. There is airport and pier tax estimated in USD $3 to be paid upon check-in in local or foreign currency. The visitor finds in Ushuaia an infinite variety of activities, a wild natural environment, and a synchrony of colors that appear in the landscape when the snow melts from the surrounding mountains. 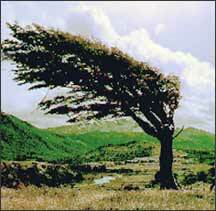 Due to its geographical position, it is exposed to strong winds year round. Evidence of this are its low constructions and the lack of vegetation in the cities, whose only trees grow bent, following the wind direction, and are thus called "flag-trees" for the shape they adopt. However, during the summer the visitors will enjoy its pleasant temperatures (December through March), and can take advantage of extended daylight hours from 3 am to 11 pm. A panoramic tour around Ushuaia would include a visit to the neighborhoods and its attractions that represent their idiosyncrasies. Departing from Maipú Avenue, towards the Footbridge Luis Pedro Fique, we will cross this narrow path that ends at La Mission neighborhood, an area chosen by the first white men settling in Ushuaia. Other districts to visit will be the Brown and Solier, built by the first immigrants at the beginning of the 20th century. During the tour, we will see old houses pertaining to the first settlers like the Bebans, Pastorizas, Cangas, Fiques, Salomons, and Ramos, among others, and the Provincial Legislature, the old government's house. Also we will be able to observe the contrast of the incredible growth produced by the arrival of new settlers during the 80's. During this city tour, we will include transfer to the chairlift at the Martial glacier that will allow us to enjoy the best panorama from the top (weather permitting). Our return will be through the Leandro N. Alem Avenue, and will continue at the Maritime Museum and Old Prison of Ushuaia. After a brief visit, we will go to the End of the World Museum, where part of the city's culture and history is exhibited. This tour is run daily. The tour starts at the pier Don Eduardo Arturo Brisighelli, and navigates along the coast of Ushuaia, with views of city buildings, the Marine Museum (old prison), the Museum of the End of the World and industrial areas. As the city is left behind, the landscape is a combination of sea and mountains, and the mounts Olivia, Five Brothers, the Fique and estancias (Patagonian ranches) can be seen. The hydrofoil sails on the Beagle Canal, towards the southwest, arriving next to the Les Eclaireurs lighthouse, on the archipelago that has the same name. In one of these islands it is possible to observe pieces of the ship Monte Cervantes, which was shipwrecked in 1930. Towards Sea Lion's Island, it is possible to observe a rockery crowded with these peculiar sea mammals, and while the visitors remain silent, we sail around the island for 20 minutes observing its lifestyle — truly a wonderful scene. Then we will continue towards Bird's Island to see the Magellanic cormorants, Imperial cormorants, giant albatrosses, petrels, squads and other species of sea bird. Later, we sail through Paso Chico, the way back to Ushuaia, with a view of beautiful, picturesque Martial Mount and its glacier. Port Arias is located at Lapataia Bay, the place where the navigation tour starts. We will embark on the hydrofoil to sail toward the east to Punta Tortugas, the gate entrance to Lapataia Bay. From here we will be sailing onto Ensenada Bay, the Redonda and Estorbo islands, Golondrina Bay and the Ushuaia Peninsula, arriving to the Bridges archipelago, where a lot of birds and sea mammals live in friendly communities. From here, we sail next to Sea Lions and Bird's Islands, Les Eclaireurs Lighthouse and back to Ushuaia. 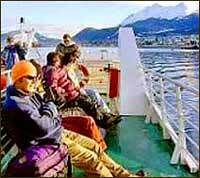 The hydrofoil departs from the pier with towards southeast, sailing first in the Ushuaia Bay on our back on the city. Once halfway to the Beagle Canal, we will pass through the archipelago Alicia, inhabited by a colony of imperial cormorants. During the tour we will have the opportunity to observe the majestic black eyebrow albatross, as well as Squads and different kind of seagulls and funny steamer ducks or alakush. Our navigation continues passing by Les Eclaireurs Archipelago. 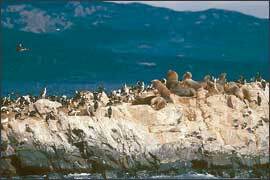 Here we visit the Seal's Island for observation of the two species of sea lions, typical of the canal (one and two-hair species). On another islands a lighthouse was built and it has the same name as the archipelago. It was indeed in this zone where Cruise Mt. Cervantes sank in 1930. Bearing east, we sail to Almanza Port (Argentina) and Port in front of Williams Port (Chile) to enter later in the area of the McKinley Pass to go directly to the Martillo Island to watch the elegant Magellan penguins. Departing from the Maipu Avenue towards the southwest on RN 3 (I-3) passing by the slopes of the Susana Mount, witness of the work of the ex-cons of the former prison, where now the Southern Railway is located. Here we will stop for a short ride tour on "The End of the World" railroad. Continuing through the valley to the deviation that take us to the Ensenada Bay, where we will be able to contemplate the Redonda and Estorbo Islands and on the other coast of the Channel of Beagle, the snow-white Mountains of the Sampaio Chain (Chile). Back again on the Route 3 overlooking the woodsy forest and its flora next to the road we will go to the Lake Roca for a hike along the lake and Lapataia River, originated in the lake. From this point we can see the Condor Hill natural border with Chile. Departing from Ushuaia on RN 3 (I-3) towards the north of the island, to reach the Fuegian Andes range through valleys and meadows covered by peat bogs. We will cross the Carbajal, the Huskies, Tierra Mayor and Las Cotorras valleys, where it is possible, during the winter to practice the cross-country skiing. The next point of the tour will be the Garibaldi Pass (450 meters above sea level), which we will use cross the Mountain range of the Andes, with the beautiful view of the Lakes Escondido and Fagnano. From here we will start the way down to the other side of the Andes and will stop at Petrel lodge besides the Escondido Lake, after a short stop will continue to the sawmills area, specifically to the Martinez sawmill (out of operation nowadays), on the coast of Fagnano lake and after visiting the Fagnano lake we will go back to Las Cotorras valley to taste the typical Patagonian lamb barbecue.